Open the flower picture that's in the zipfile. 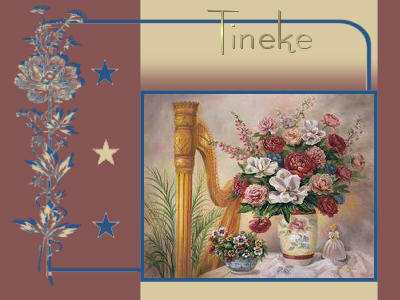 Draw a rectangle selection with your selection tool on the inside of the blue borders around the flowerpicture. Flood fill the selection with the background color. Hit the Delete button on your keybord. Choose the mask with the name: JD Mask30. You can click with your eraser on the left side of the line, then press your shift while you click the eraser on the right side. Everything between these two click will be gone on that layer. Select your Preset Shape Tool and choose the Symmetric Shape. Draw a star in the area between the flower of the mask and the flower picture. If you look at your layer palette, you will see this is a vector layer. Click in the palette with your right mouse button and select Convert to raster layer. Click again and select duplicate. Do this twice. It still looks like one star, but there are 3 now. By clicking on the eye behind the layer, you can see on witch layer the star is. Select the bottom star with your magic wand tool and flood fill with the blue color. Do the same with the upper star. Layers - merge all layers. 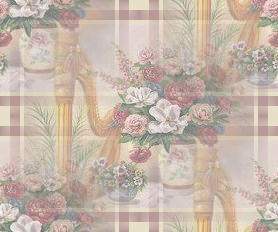 Change your background color in a nice pattern or color from the flower picture. I've used a goldpattern. Type your name and move it to his place. I hope you enjoyed this tutorial and let me know in my guestbook.